FITZROVIA'S EXQUISITE RESTAURANT / CAFÉ QUARTER is part of what you expect behind living in the Gabled architecturally style Dudley Mansions on Hanson Street. This is now one of London's most popular West End locations and this delightfully presented 1 st floor apartment has a warm welcoming atmosphere delivering a well designed reception and fitted kitchen and double bedroom on a split level. 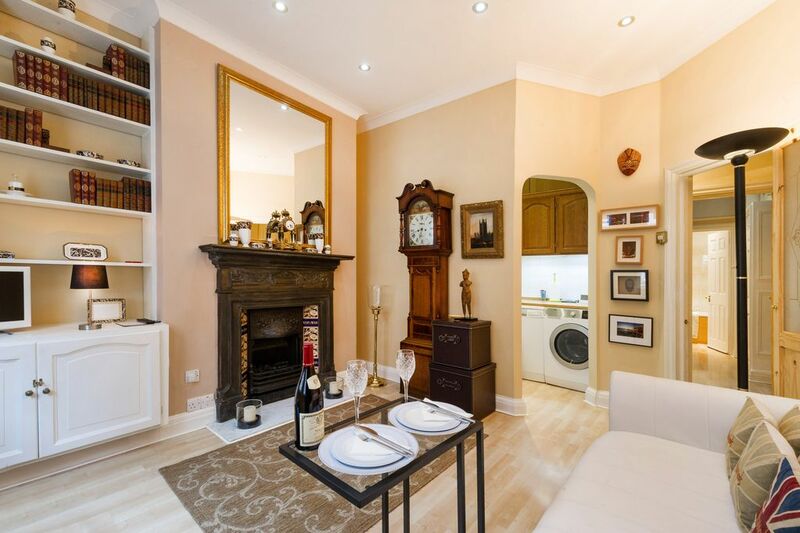 Lovely quaint apartment just minutes away from the shopping haven of Oxford Street. The apartment has a double mattress/bed on the top level of a split level room, below you can find some storage compartments. The apartment is well equipped - you will find everything that you need to cook a lovely meal in the kitchen, fresh bed linen and fluffy towels and free and fast up to 80Mbps fibre broadband. There is a bathroom with a bath tub and a shower above it. Other amenities also include: electric heaters, automatic hot water, hair-dryer, iron and an ironing board, free wifi, cable TV, washing machine, drying rack in the bathroom, cooker/microwave/oven, French press cafetiere, fridge and a small freezer, toaster and kettle, and a fully equipped kitchen. The whole apartment is for access. One of our representatives will meet you on arrival to check you in and should there be any emergencies during your stay, we will provide you with an emergency out of work hours number. Please let us know your arrival time, as additional charges may apply for check ins after 18:00hrs on a weekday, any time weekends, and bank holidays. 1. What is the check-in and checkout time? – We’ll meet you at your chosen property to check-in any time after 2pm. You can reserve an early check-in (subject to availability) from 11am at the additional cost of £20 or an early check in prior to 11am at the additional cost of £40. Please call our Reservations Department 2 -3 days ahead of your check-in date to check the availability and book that. Check out time is at 11 am . - A late check-out until 1pm can be pre-booked for £30 (subject to availability), please call our Reservation Department 2 days prior your departure to check the availability. 2. Are there any other additional expenses? – There is an additional statutory charge of £70, which covers cleaning and administration, added to your total holiday stay. Other additional charges may apply if you require out of work hours check-in between 6pm and 9am (Monday to Friday), anytime during Saturday & Sunday, and Bank Holidays (£60). This is payable via the website. We’re more than happy to source those little extras to make your stay more practical and comfortable. A baby chair or cot, for example, costs £30. We can add these to your total night’s stay price when you pay via the website. – No, there is no air-conditioning but if you’d like a fan for the apartment we’ll provide one at no additional charge. 4. What is the currency of the prices? – All our prices are in Great British Pounds. 5. Do you provide an airport pick up service? – At the moment we do not provide pick up services from the airport. 6. How do we get the key for the apartment? – Once the booking is confirmed, we’ll send you everything you need and be waiting for you at an agreed time on the doorstep to your new pad with the keys. 7. What are the ways to make my payment? 8. After the check out at 11:00am, is there a storage facility that we can use to store our luggage until our departure? – No, unfortunately not. However, we suggest you use the storage facilities in Kings Cross St Pancreas Station. They’re a short distance from any of our properties, and provide a safe and inexpensive service. 9. Our arrival is very late in the evening / early in the morning / during the night – is this a problem? – No, we’ll make sure there’s someone to meet you at the property when you arrive. Please note that for out of work hour's check-ins, when our office is closed, there is a charge of £60, which you can pay for on our website. 10. What if my arrival time has been delayed / changed? – If your arrival time has changed, please just make sure you let us know via phone or email so we can be at the property at your new arrival time. 11. Do you provide bed linen and towels? – Yes, we provide crisp fresh linens and fluffy towels – enough for the whole household. 12. Can I cook in the kitchen? Is it fully equipped? – Yes, the kitchen is packed full of everything you need to cook up something wonderful. You’ll find a full set of cutlery, plates, glasses, cooking pans etc. 13. Is there a washing machine in the apartment? – Yes, there is a washing machine in the apartment. 14. Is there parking space that comes with the apartment? – No, the apartment doesn't come with a parking space. 15. What if there is an emergency during our stay? – We’re going to provide you with a phone number that you can call 24/7 in case of an emergency. I loved this flat primarily for its location. It is within walking distance to restaurants on Charlotte street, the British museum, covenant garden, and Oxford Street. There is a great little coffee place a few doors down, restaurants and pubs around the corner. It was small but about the right size for 2 people. I never really used the kitchen but the bathroom was beautiful and clean, a bit on the small side but functional. There is a utility room where you can dry your laundry. The room also has a printer with printing sheets all stocked up. The bedroom is up the stairs in a loft space. You have to go up the ladder and crawl into bed, This could be a problem if you have mobility issues but we were OK with it. The loft faces the courtyard in the back so that it was very quiet at night for a central London flat. The location was absolutely amazing. The loft was pretty cramped for sleeping (with only a few feet of space from the bed to the roof) but it was suitable for us. This apartment was wonderful. It’s in a great area and very centrally located. It was nicely decorated, clean, and cozy. The loft does get quite warm at night but that is the only negative for my whole stay (there is a fan, though, if you don’t mind white noise). I would stay here again in a heartbeat. Wouh! Thank you Ms. Austin to write a review about your stay with us. We are over the moon to hear that you’ve enjoyed your holidays staying in our apartment. Thank you for your valuable feedback about the heaters, we will make sure to improve on that in the future. Shall you ever come back to London please let me know, we will be happy to host you again. Amenities we're good, price was reasonable. Only suggestions for improvement is more airflow in the bed loft and a step on the outside of the tub, as stepping down that far from a slippery position had me catching my balance more than once; could see someone taking out the nice glass door if they went the wrong way. Thank you for your valuable feedback about the suggestions, we will make sure to improve on that in the future. Beautiful place, great location, with some draw backs. Alright, let's start off with the good. The location is great! It's a 10-15 minute walk to five tube stations, so you can get anywhere in the city pretty quick. The Oxford Circus and Goodge Street (make sure you take the elevator, otherwise you are going down a ton of spiral stairs) stations are the closest. We checked in at their main offices just down the street from the apartment, Dannie walked us to the apartment and gave us a 15 min introduction to the place. The apartment is beautifully decorated, it's small but cute. The bed is in a loft, so you have to watch your head if you are tall when going into the bedroom. Now for the bad. We went in late November and it was cold in London, but we were prepared for the cold. The thing that we were not prepared for was the coldness of the apartment and the cigarette smoke. The apartment is smoke free and there are signs everywhere not to smoke. We checked in early afternoon on a Thursday and their was little smell. However, after going out to explore and dinner we came back to an apartment that smelled like an ash tray (coming from a neighbor). The smell is generally distasteful for me and gives me a headache, but my wife is asthmatic and has a hard time breathing with the smoke. The smell was the worst in the living/kitchen area, the bedroom/bathroom weren't as bad. But, this is when the second problem became apparent, the heat in the bathroom and bedroom doesn't work as well as the living room. So, you could be in the living room and not breath because of the smoke, or be in the back and be cold. The heaters are set on a timer (I couldn't find the timer) and they do not run often enough for my taste. It probably wouldn't have been as bad if we could had the door open to the living room. We told management about our problems on Monday (we thought that the heaters in the back didn't work at all at the time), they told us that there wasn't much they could do about the smoke and that they would check the heaters. By the time the left on Saturday we were still cold and we were opening the window in the living room to get the smell out even though it was freezing. I would recommend the apartment, but only if you go in the summer or if the smell of smoke doesn't bother you. I really wanted to love this place and the cold wouldn't have bothered me if I could have had the doors all open to equalize the temps. I know the smoke is out of their control, but I would want to know if booking again.